GBBD – March 2016 – A Tour Round the Garden. On the 15th of every month May Dreams Garden host Garden Bloggers Bloom Day. I am a few days late but looking at everyone’s garden got me out into my own. Go to her site to see the links to beautiful flowers around the world. Lately I have been snapping photos with my phone and sharing them on Instagram. 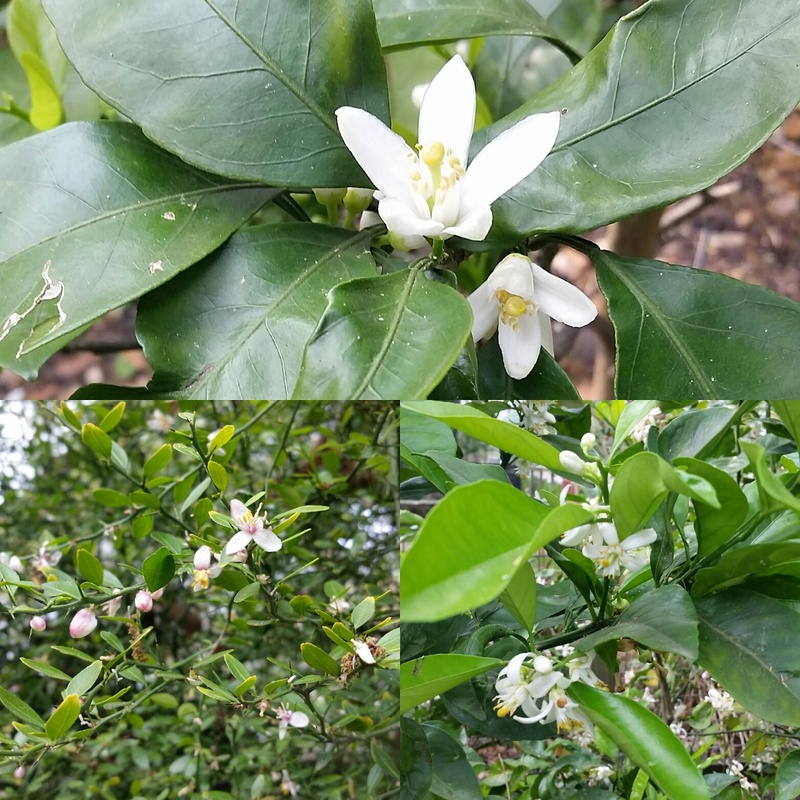 This is a collage of blossoms from our citrus tree hedge. We have a Meyer lemon, Satsuma, Fingerling lime and Moro Blood orange. These are trees that we are triming into a boxed hedge about 8 feet tall and 4 feet wide. It is something I read about and decided to try it since space is at a premium. Yesterday I took a few breaks from the chaos of remodeling and the designs that await my attention just to chill and enjoy the garden. I have been sleeping on the sofa all week waiting for the paint fumes to abate upstairs. 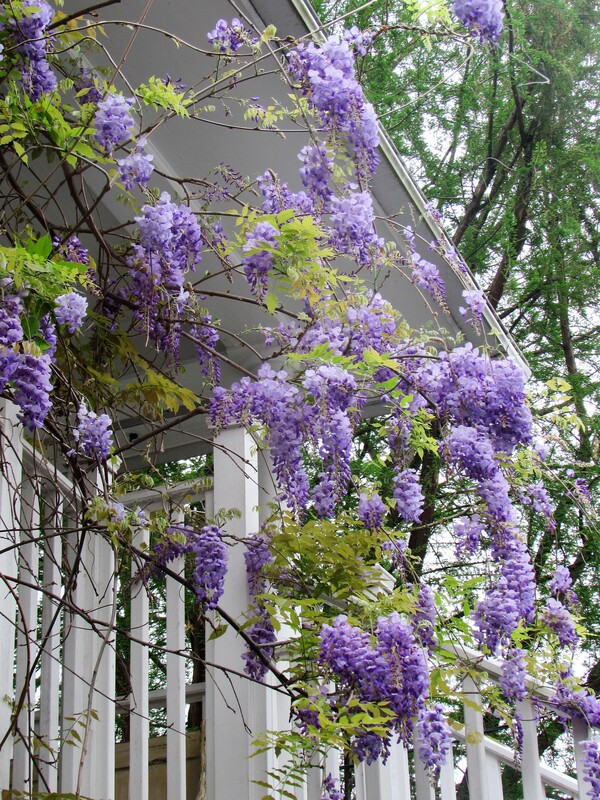 While checking out our new windows I noticed the wisteria covering the back cottage above the garage was in full bloom. Here is a close up view. 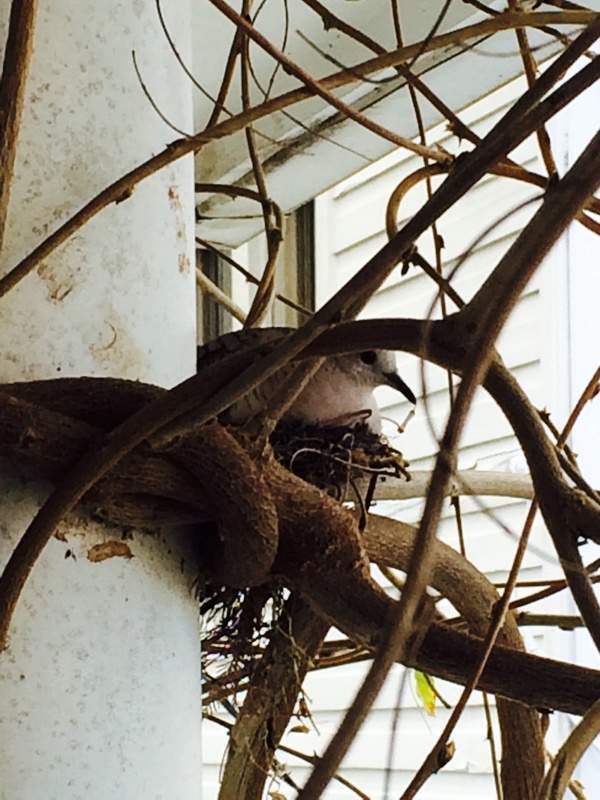 And look who is nesting in the wisteria : ) This is a photo BFF and renter took. 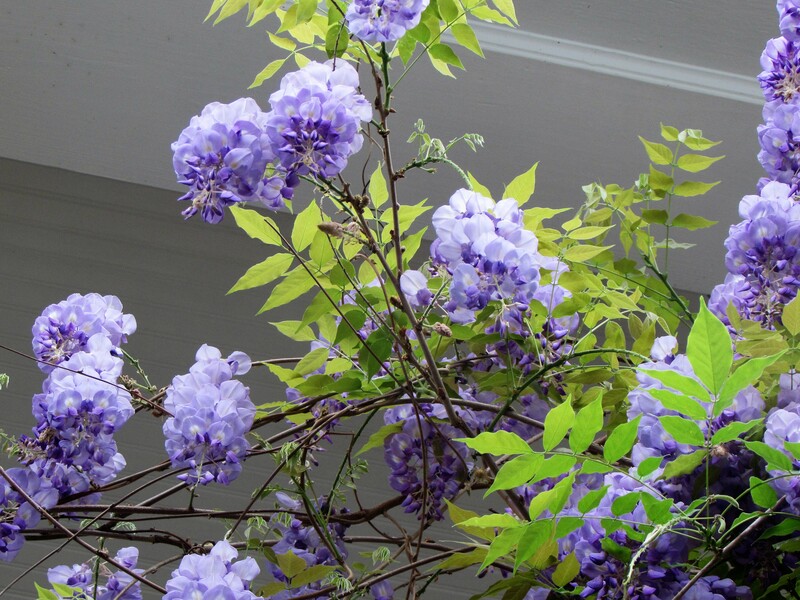 I love looking up into the wisteria blooms, the color delights my senses. 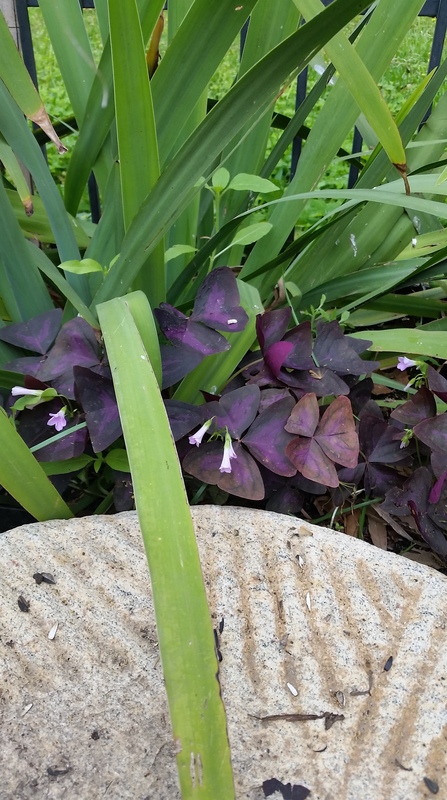 Purple shamrocks, Oxalis regnellii we planted from seeds a couple of years back. Here is a newcomer to our garden. It isn’t even planted yet. 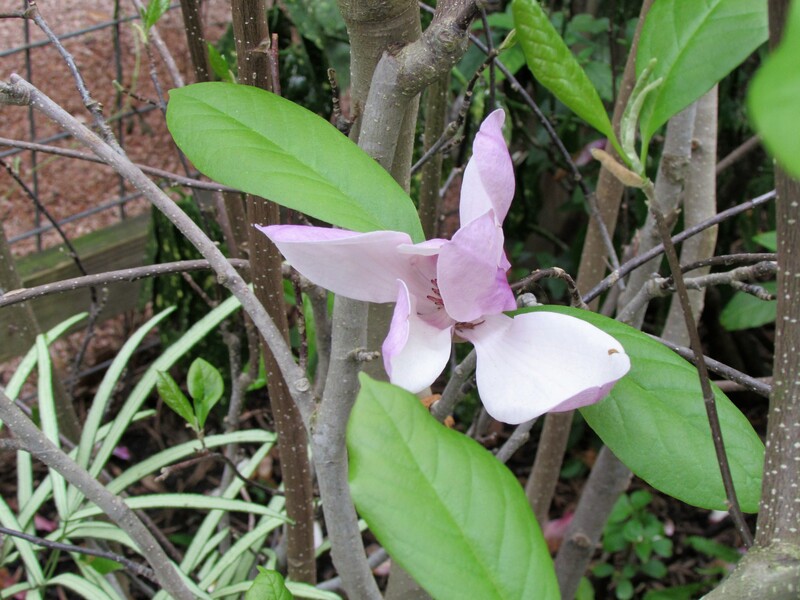 Anacacho Orchid Tree, Bauhinia lunarioides (B. congesta). 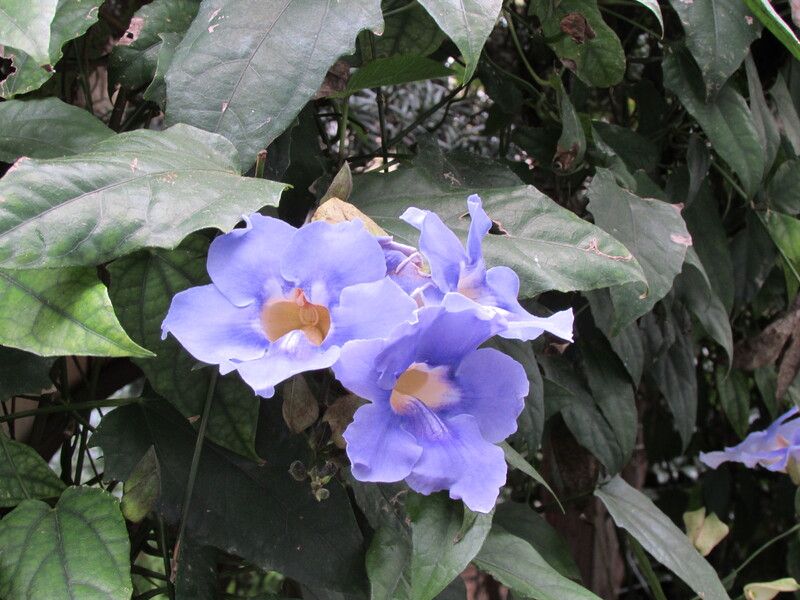 This one is native, but rare, in Texas and more common in Mexico. Two years ago our Blue Sky Thumbergia vine froze to the ground. Last spring it didn’t bloom but a few flowers. This year it has lots of beautiful flowers. 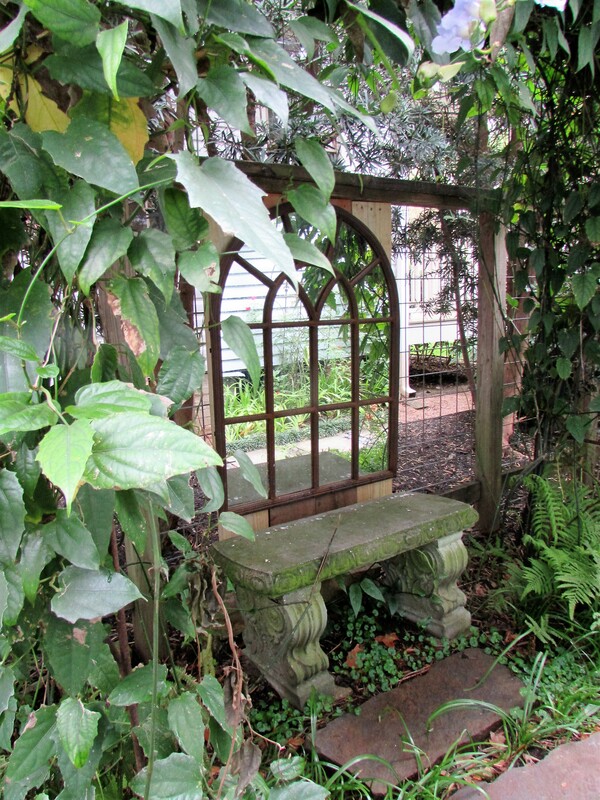 The vine is supported by a iron arbor. Under the arbor we have a cement bench. Last year we added a mirror to the space to brighten it up! Lately i have been hearing knocking and come to find out it is a blue jay knocking on the mirror. Not sure what he is thinking while looking at his own reflection. This is a a video Shawn shot of his crazy dance! I would love to know your thoughts on what he is doing. His mate is heavy with eggs so I wonder if he is protecting her. 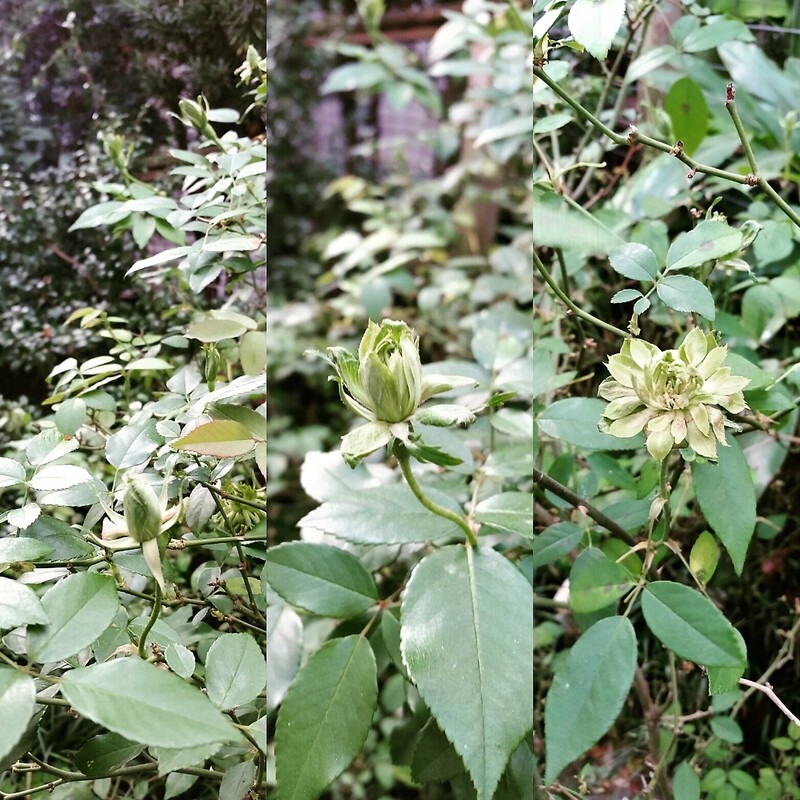 Okay back to the blooms : ) One of my favorite unusual plants is our Green Rose. This is another little collage I did with an app called Layout. The Saucer magnolia we rescued in a clean up is over 8 feet tall now. I missed the best of its flowers. I do enjoy watching it right outside my window when I sit and work at my computer. 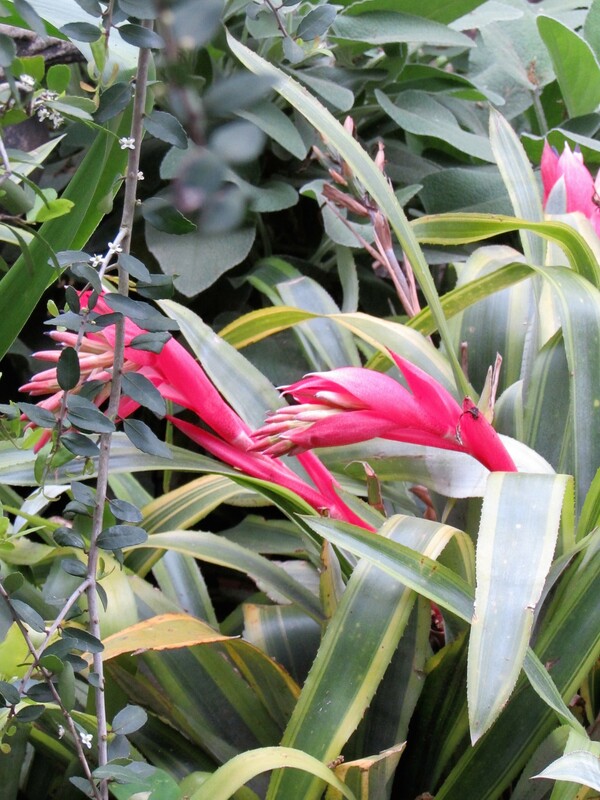 The bromeliads we planted in the ground are full of blooms. They were a gift from a friend that found them while foraging in Mexico years ago. They are spreading and I am going to have to start digging them up and sharing them. The branch is from our Weeping yaupon. 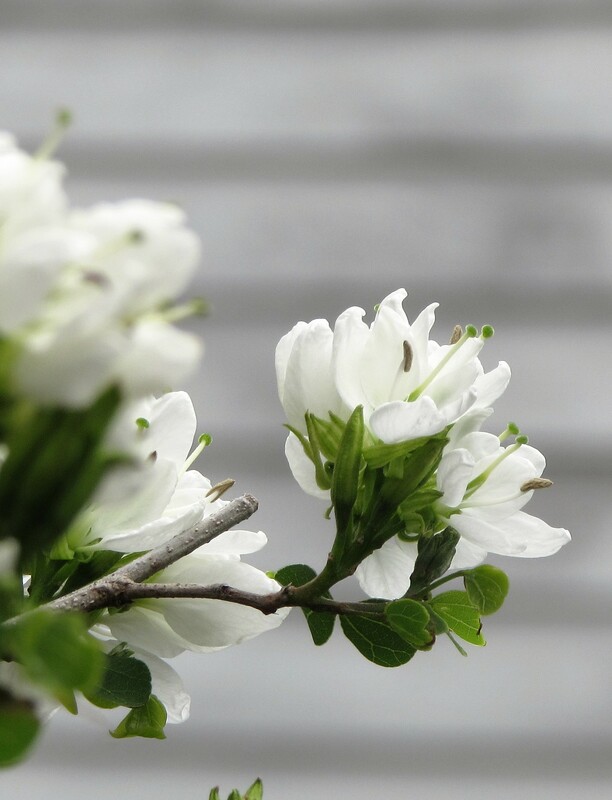 I love the delicate tiny white flowers. March is lovely in Houston. The weather is usually nice enough to have the doors open part of the day and the evenings are perfect for sitting on the porch and sipping wine while watching the world go by! 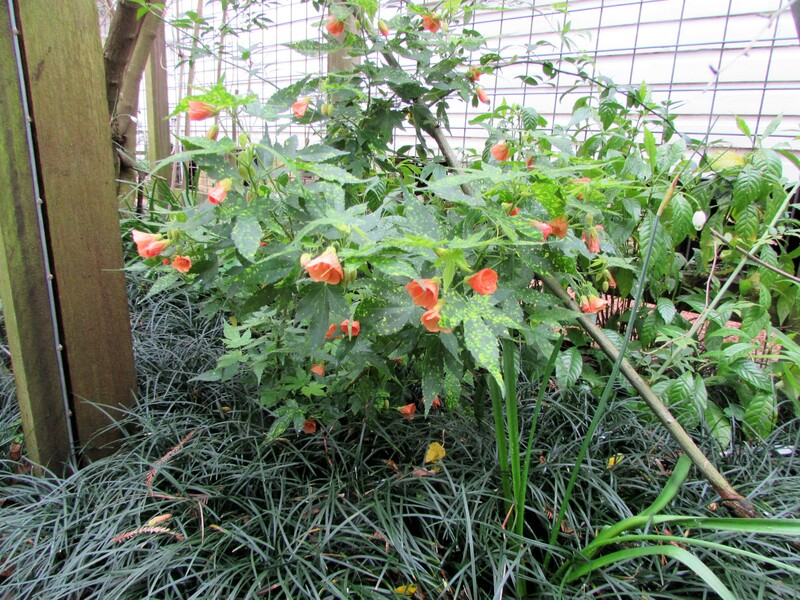 I am still enjoying blooms on the Abutilon ‘Salmon Variegated’ which I blogged about in early February. It seems to have doubled in size since we planted it. 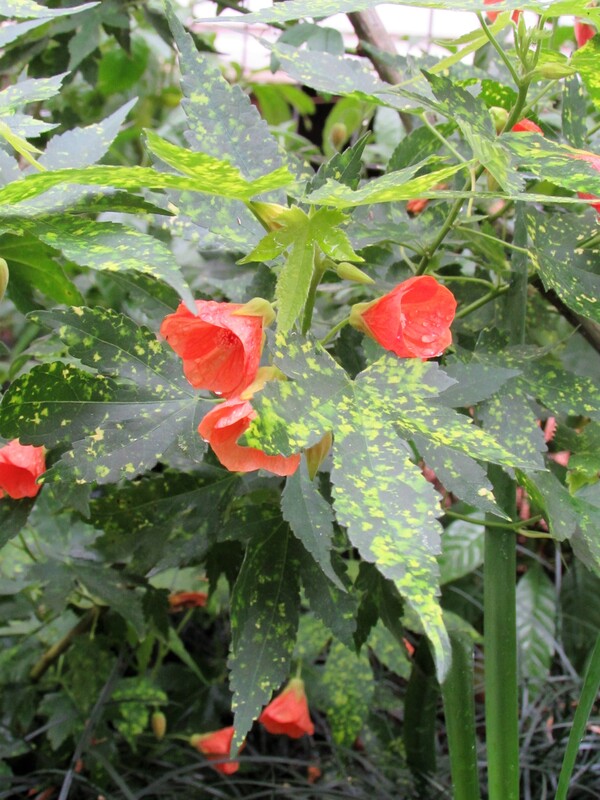 I love everything about it from the peachy orange flowers to the speckled green leaves. Hmmm what to share next? Oh yes, we have a new apple tree. One of our two espalier apple trees died last summer so we replaced it. We chose a ‘Carnavale’ apple. According to Urban Harvest – “Carnavale – Newest apple for the Gulf Coast, Carnavale is yellow,but with pronounced rosy-red blush overtones. Looks more red than yellow. The fruit is firm, the flesh is crisp and the flavor complex –sweet with a tart overtone. A heavy bearer of uniform rounded fruits. It is early to flower, just slightly later than Anna, with a similar ripening date. Originally from Brazil. 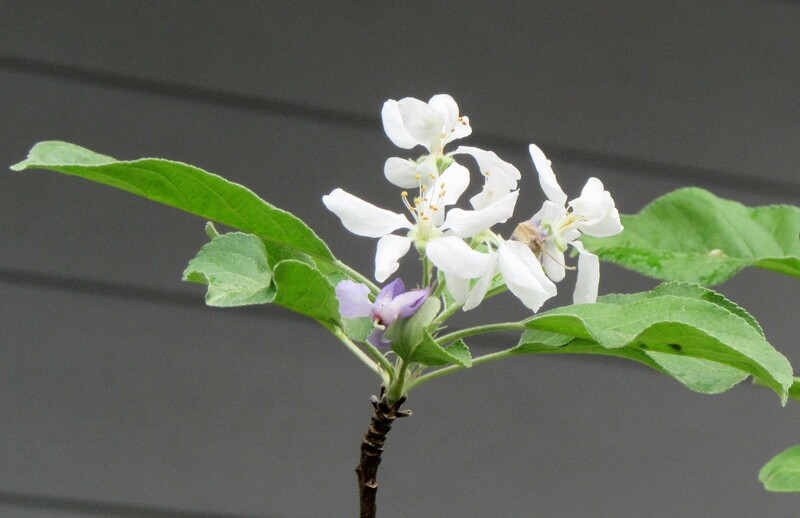 Good resistance to fireblight–heat and humidity tolerant. Self-fruitful.250-300 chill hours. Aren’t the blooms beautiful? 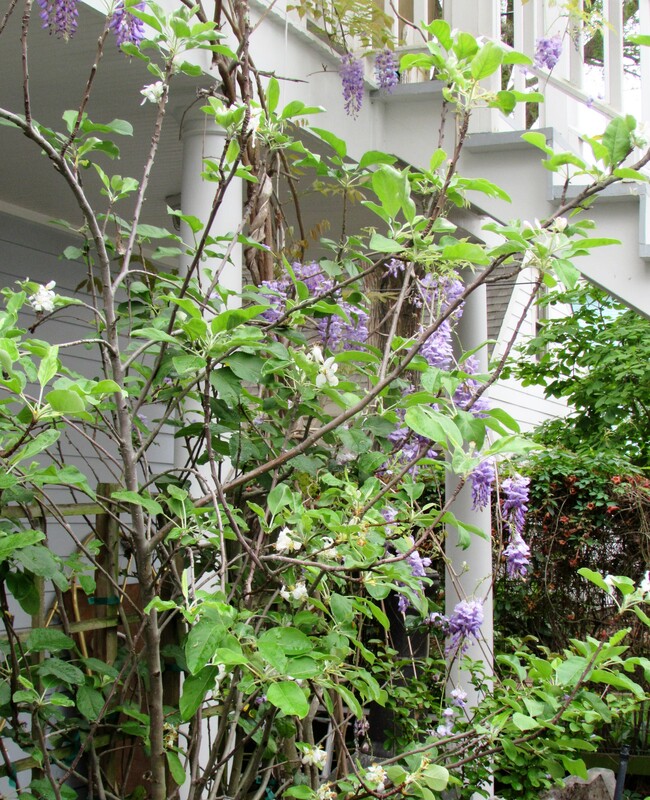 I like the mingling of purple and white flowers! The tree clearly needs a bit of training but first we are letting it root in. 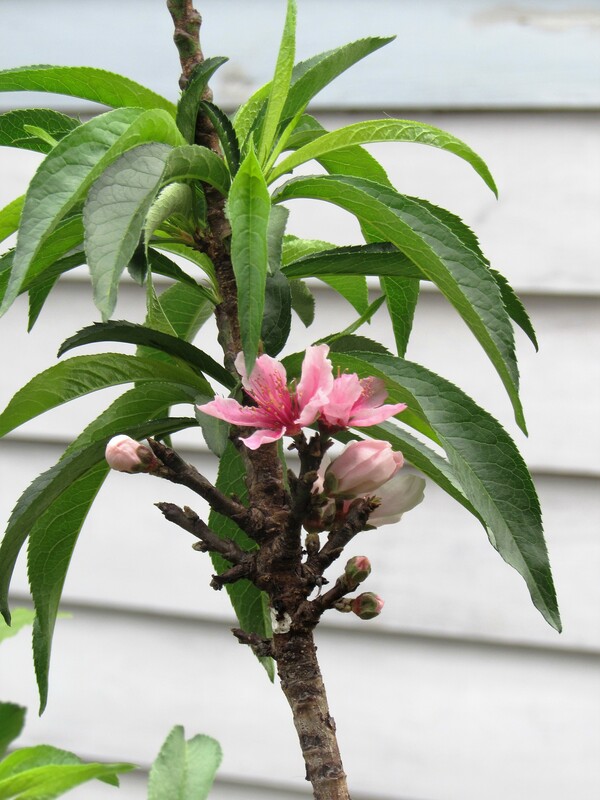 Our Dwarf peach tree that lives in a large pot is full of pink blossoms. It has had a couple of peaches but none have grown big enough to eat. This year looks promising. Out front the Saliva greggii is going strong after we cut it back hard last fall. The Mexican sedum is about to bloom but not yet. This bed was under water for many hours during the Memorial Day flood last May. 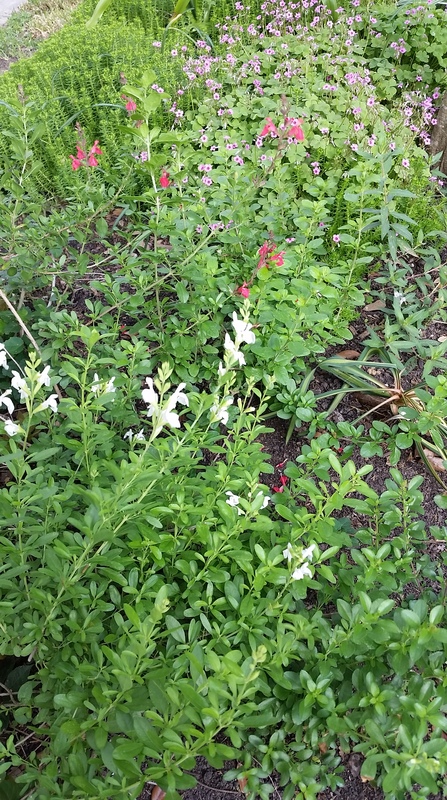 It is our test garden using the right-of-way. It is not irrigated but having 80 inches of rain this last year it didn’t need to be. Here is a testament to how mild our winter was here in Houston. 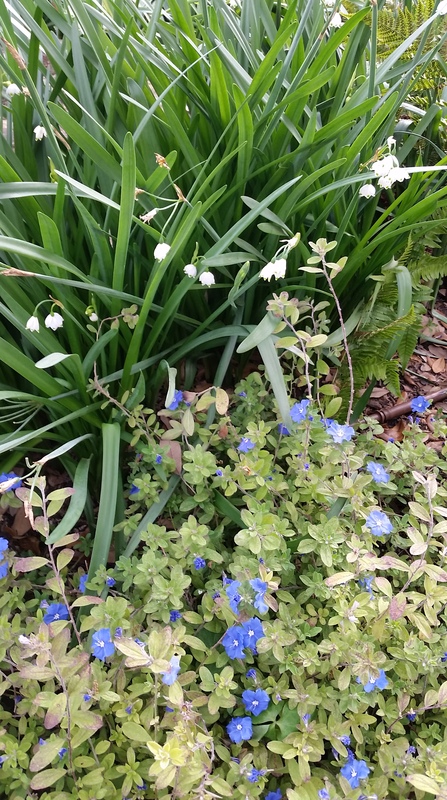 Never have I seen our Blue Daze in bloom with our Snowdrops! 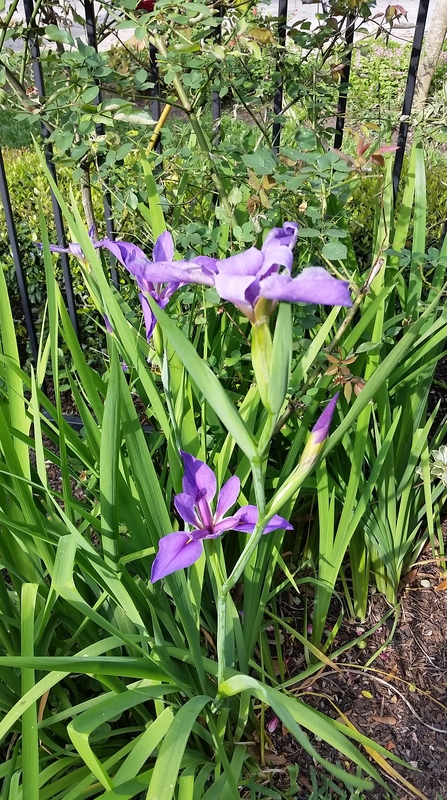 I don’t remember planting Louisiana irises here, perhaps it is another kind…it would be early for the Louisianan irises. Not matter I am enjoying them. 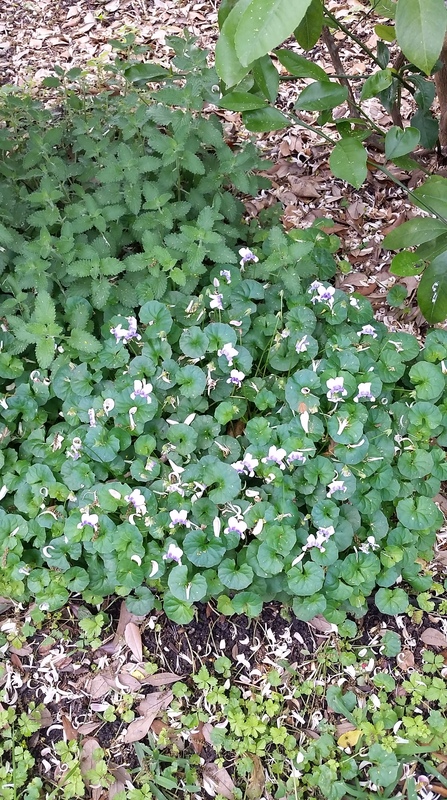 I finally found a place to grow Australian violet, Viola hederacea. I have seen them thrive in many gardens here but hadn’t been successful till this spring. The citrus have been dropping white blossoms on them but I don’t think they mind. I must not forget the Mme. 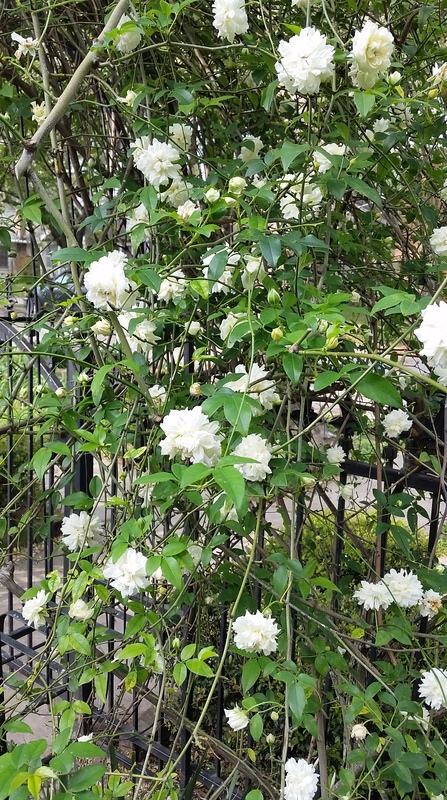 Alfred Carrière Climbing Rose, which have been in full bloom every year by the first day of spring since I planted them, except the year we planned our outdoor wedding blessing and we had freezing rain the 1st day of spring : ) That freezing cold day was 6 years ago. 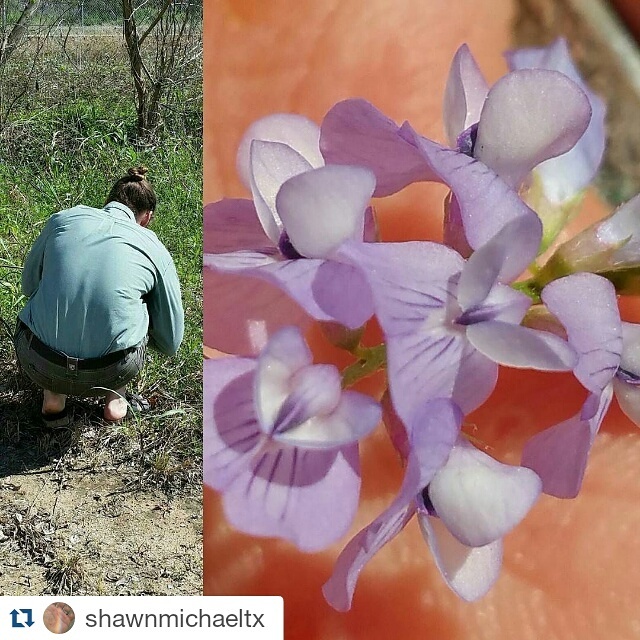 Here is a recent Instagram collage I did of Shawn taking a picture of one of his beloved tiny blooms. Happy Anniversary to the love of my life, Shawn Michael. May our garden continue to prosper and grow! Happy Gardening! I always enjoy your project posts, but seeing your own garden is a special treat. It gives the lie to the old saw about the cobbler’s children having no shoes. Oh. Laurin. These photos are beautiful but I can only imagine how amazing it must be to smell a citrus hedge! wow. This was a super mild winter for us too. My esperanza usually dies to the ground and normally at this time of year I see sprouts pushing up. This year? Over my head and already in bloom. Crazy. It is a crazy year with no real winter. And now all this rain! I am wondering what summer will bring. Hope you and yours are safe. We’ve heard some scary stories coming out of Houston. Thank you for asking Debra. I live on high ground here in the Heights and in a pier and beam house. The garden is pretty soggy but it drains quickly. 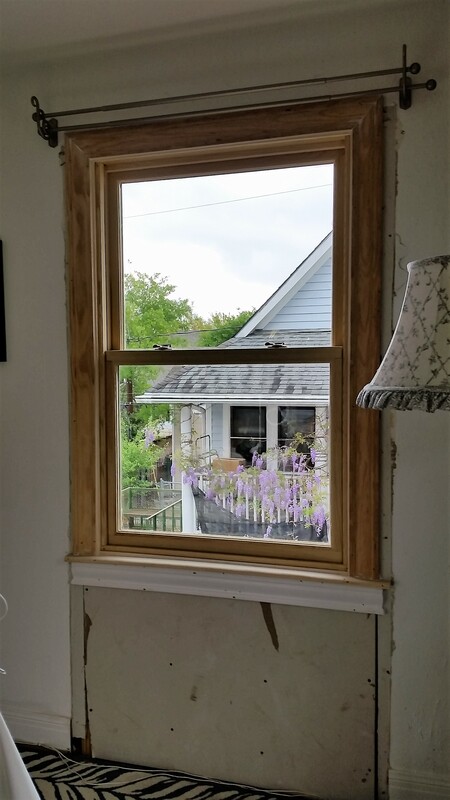 Much of Houston is a mess. My son hasn’t been able to go to work for 3 days. He is a teacher in Cy-Fair. I have never seen it flood like that in Cypress before. It is devastating for so many. Today I am figuring out how to help my crew who can’t work this week. I sure to hope to visit your garden one day, Laurin! It’s so lovely. Pam, I would love you to come visit! I have two guestrooms : ) just finished all the upstairs remodeling, yeah! The garden is part cottage and part plant collectors….no real design : ) I justify it saying it is a test garden…which it is in many ways!